This is an IHRSA featured article, brought to you by Jacobs Ladder. Today’s club owner has never had a greater selection of equipment to purchase. The industry has also seen an explosion in exercise programming, as well as innovations that integrate group training, heart rate, and functional fitness. It’s another sign that creating a one-size-fits-all health club is harder to achieve. This variety is an advantage, but it’s also a challenge. No club can be all things to all people. And equipment is expensive. According to the IHRSA Health Club Equipment Report, average spending on equipment is around $85,000 a year (based on 2015 figures). That level of investment requires a thorough understanding of your specific needs. With today’s data capabilities in determining membership demographics, you have a good idea of who your customer is. The questions you have to ask yourself are: Do I have the type of cardio machines, resistance equipment, and classes to maximize membership and retention? Is my equipment inventory limited to the extent it’s excluding potential members from joining? Generation Z (ages 6-17): high-impact/intensity training; dance, step, and other choreography; cardio kickboxing. Generation Y (ages 18-34): high-impact/intensity training; barre; cardio kickboxing. Generation X (ages 35-54): elliptical motion/cardio cross trainers; free weights; weight machines. Baby Boomers (ages 55 and older): aquatic exercise; stationary cycling (recumbent); stretching. There’s more to serving members than the quality and type of workout. Lifestyle preferences and other priorities can make a big difference. For instance, three out of four Millennials say they are willing to pay extra for green products and services, and put a high value on sustainable equipment. Generations Y and Z want up-to-date technology options. Baby Boomers want a quieter club environment. This wide variation represents the challenge of serving today’s health club membership. But it shouldn’t distract you from the core requirements members expect. Despite a growing appetite for dance fitness and cardio kickboxing, equipment utilization is still the No. 1 activity at health clubs, with more than half of members indicating that they use cardio machines (62.3%). Treadmills still rank as the most used equipment category in health clubs, and elliptical and stair climbers are still a major draw for members. It makes sense that club owners on average devote 45.9% of their equipment budget to cardio machines, according to IHRSA statistics. Those preferences have remained consistent over the years. But the capabilities and functional aspects of machines have improved dramatically. IHRSA trend reports tell us that having access to a variety of equipment ranks high as a reason for members to continue to use their health clubs. Finding cardio equipment that can capitalize on combining disparate fitness trends is a clear advantage. The new Stairway GTL, created by Jacobs Ladder, is a step in that direction. It’s the only commercial stair climber made for all ages, says the company. 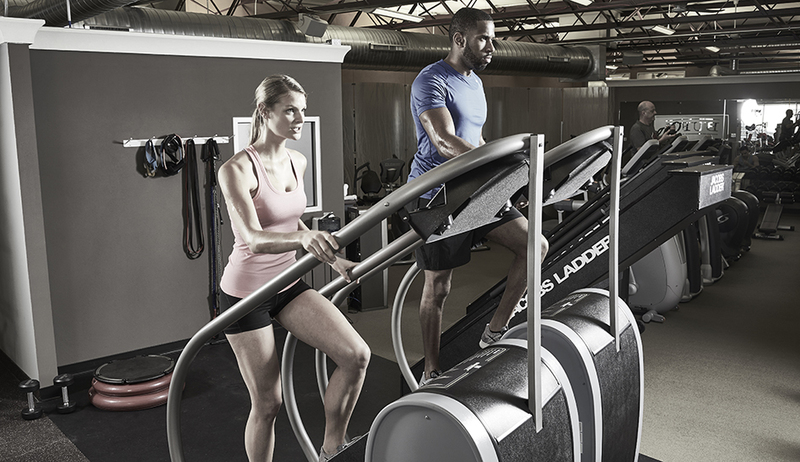 Jacobs Ladder is a patented climbing machine with ladder-type rungs on a non-motorized continuous treadmill. Re-engineered in 2004 by entrepreneur Bob Palka, Jacobs Ladder is used by pro football teams, the FBI, the Army, the Navy, West Point, and numerous Division I universities to improve their strength and conditioning programs. Despite its ability to service serious athletes, Jacobs Ladder (along with its alternative, Jacobs Ladder 2) is ideal for any type of membership. has an intuitive console with a color LCD with LED back light. For the club owner, the Stairway GTL is priced lower than other commercial stair climbers from major manufacturers. And you’ll save money after your purchase, because it doesn’t need to be plugged in, so it won’t add to your energy costs. To learn more about the Stairway GTL, Jacobs Ladder, and Jacobs Ladder 2 machines, visit the company’s website, call them at 1-866-697-4100 or send an email.